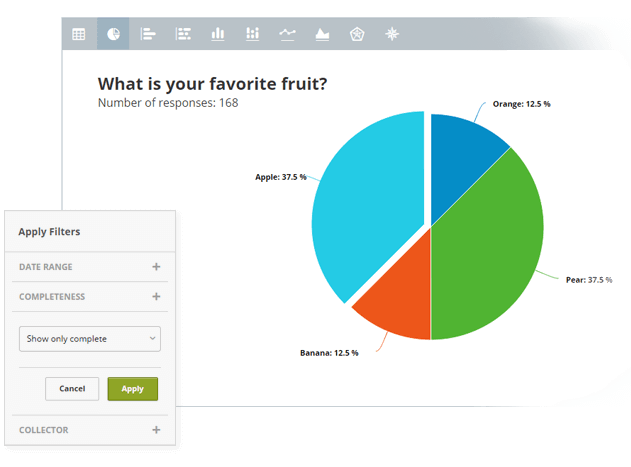 Creating beautiful online surveys just got easy. Free online survey tool. Unlimited surveys, questions and responses! 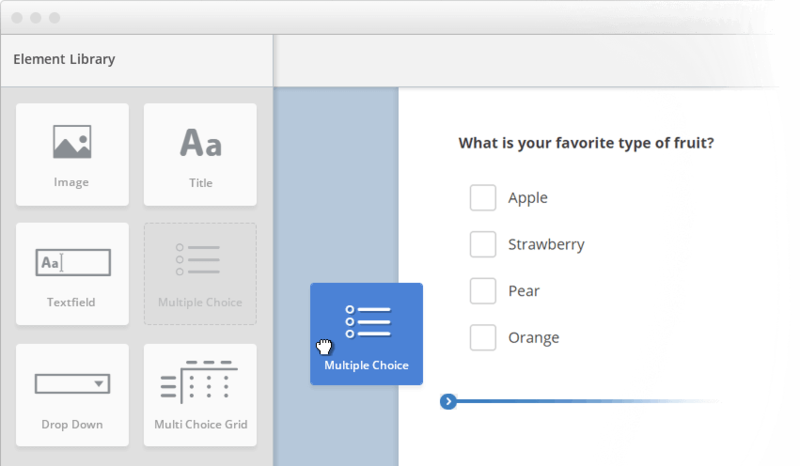 Our wonderful drag and drop builder lets you create online questionnaires in no time. You can choose from a wide variety of question types and modify them to suite your needs. 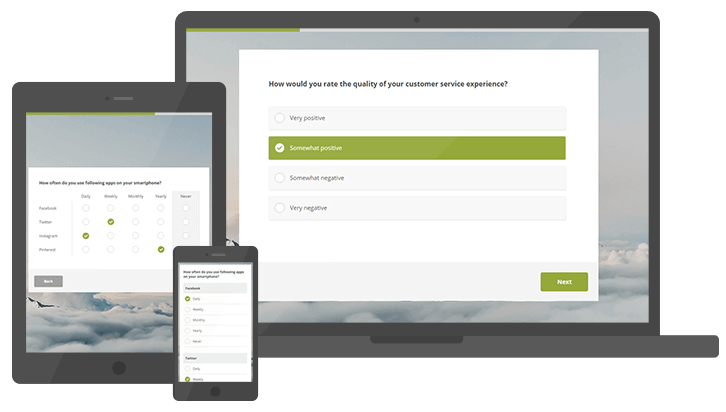 Choose from different themes or use our white-label solution, translate your survey into multiple languages and much more. All you need to start is a free account! 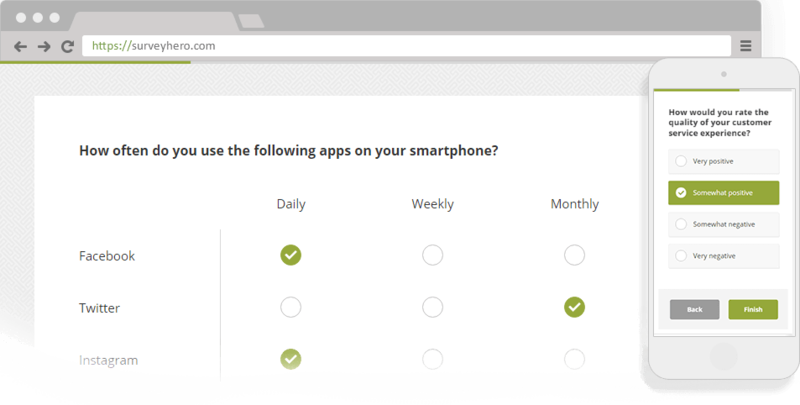 Easily set up and share a survey link with your target audience by email, post it on Facebook, Twitter or any other Social Network. 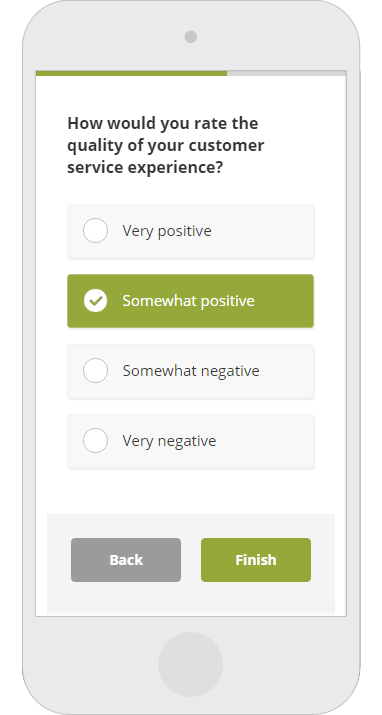 You can even embed the survey directly into your website. Our questionnaires are automatically mobile optimized. Participants can answer your questionnaires on any device: Desktop computers, notebooks, tablets or smartphones. Watch your participants responses being collected in real-time. You can view every single response, one by one, or analyze grouped data with our automatic diagrams and summaries. Choose from different diagram types, filter your data, create PDF reports, export to Excel and CSV, and much more. It's all built in! Our state-of-the-art infrastructure allows us to achieve high security and availability, so that you do not have to worry about your survey not being accessible when you launch it. All of our pages and online surveys are only accessible via encrypted connections (SSL, TLS or https). Our fail-safe server infrastructure ensures that your questionnaires remain available at all times. Automatic continuous backups allow us to recover all of our data, even to the minute - should we ever need to! Our servers scale as needed so that your surveys always load quickly, even if a lot of people participate in it. Our servers are located in Ireland and our head office is in Switzerland. We will never store your data outside of Europe.